... la preuve avait déjà été apportée depuis longtemps que le cliché de la pochette n'avait rien à voir avec l'oeuvre de l'ami des zoos. Merci, Claude, d'avoir très tôt cru en la version Boyfriend qu'Eric et moi avions exposée dans La France et les Beatles vol. 1 - La discographie originale 1962/1970 (p. 53). Tu ne t'es pas focalisé exclusivement sur la piste Dezo. Tu as montré de l'intérêt pour cette piste Boyfriend. Tu as pris en compte la source même de cette information relative à ladite piste (le livre Beatles London de Mark Lewisohn, Adam Smith et Pete Schreuders). Tu as toi-même réalisé ta propre enquête sur d'anciens numéros de Boyfriend. Et tu es donc tout naturellement parvenu à la même conclusion que nous grâce à ton ouverture d'esprit. Je regrette que, depuis la fin du mois d'août, Filou n'ait pas trouvé le temps de venir nous dire combien il était heureux d'avoir enfin pu obtenir une réponse définitive à ses interrogations légitimes. Dis, Filou, c'est si dur que cela d'admettre que Krasker et Hocquet avaient raison dès le départ? Ce qui fait bander Claude c'est les gros nichons. Bah ... il n'y a pas de quoi se fâcher et l'important est de continuer à se parler, non ? N'empêche que c'est du grand art. C'est vrai qu'il fait un ... bond au classement. On peut même se faire une série "BOB" ? alors là, le livre/catalogue de cette expo est tout simplement magnifique, et c'est comme cela que je m'entends quand je dis 'imprimées comme il faut'. Pour l'instant quelques infos: 208 pages, cartonné, il y a un chapitre pour chaque année des Sixties et à la fin de chaque chapitre il y a deux pages bien jolies pleine d'images de disques, partitions, magazines et pubs qui resument le panorama musical de l'année. Les photos elle-memes, une pour page, sont de qualité extra et le papier est comme il faut. Et à propos de la Fiona Adams, la photographe de ce fameux cliché. D'ailleurs, on voit tout ça (expo, clichés...) sur son site. 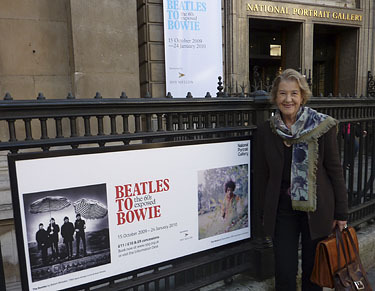 Fiona at the opening of the Beatles to Bowie exhibition at the National Portrait Gallery in London, with Bill Francis, Photographer and Maureen O'Grady, Pop Writer for Boyfriend and Rave magazines. Hé ben tiens, voila même ton fameux JUMP. 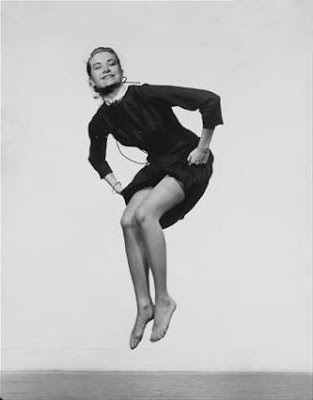 Et puis aussi le pourquoi du comment et l'influence d'un certain Philippe Halsman. Fiona’s early assignments featured standard profiles of singers like Billy Fury and Adam Faith for the magazine’s pull-out centrefold. But she was beginning to think deeply about how she could make her shots stand out as the music scene took off in the UK. It was this thoughtful, well-planned approach which led to her most famous photo: the Beatles jumping in the air, used uncredited on the sleeve of their first EP, Twist and Shout, in 1963. 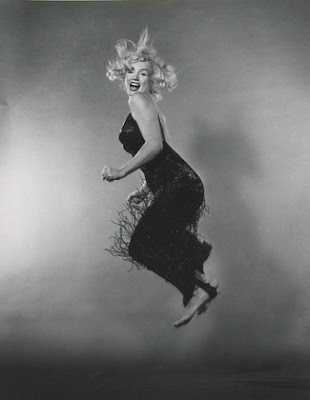 The picture has often been said to epitomise the swingin’ sixties scene and helped set the tone for the era, and it came about partly thanks to the influence of an American photographer called Philippe Halsman and Fiona’s unique approach. Halsman had published a book in 1961 called Halsman on the Creation of Photographic Ideas in which he had set out three rules for producing distinctive photography: “the rule of the unusual technique”, “the rule of the added unusual feature” and “the rule of the missing feature”. Halsman had arrived at these precepts through his experience on a 1951 commission from NBC to shoot famous comedians of the time such as Bob Hope, Sid Caesar and Groucho Marx. 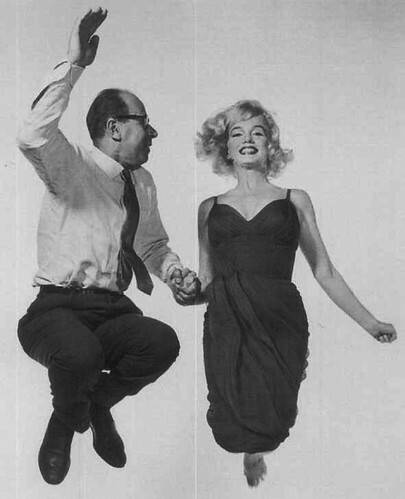 He captured many of them jumping in mid air which led to him adopting this as a style in his later work where he snapped such celebrities as Marilyn Monroe, Brigitte Bardot and Salvador Dali, all mid-jump. 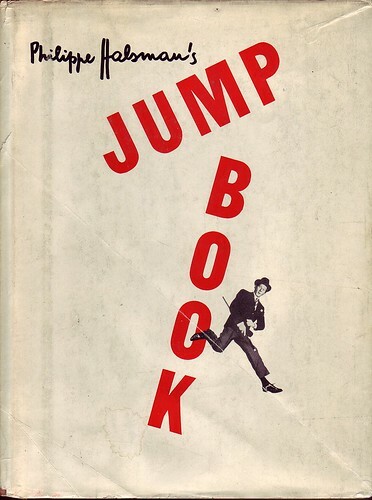 He published his shots in a 1959 volume called Jump Book, containing 178 celebrity jumpers in all. 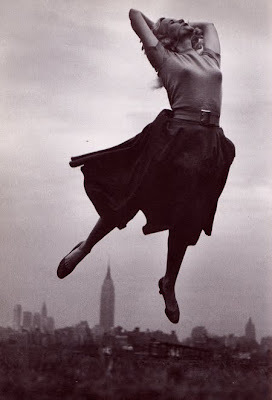 He explained: “when you ask a person to jump, his attention is mostly directed toward the act of jumping and the mask falls so that the real person appears.” Halsman even claimed to have developed a philosophy of jump photography, which he called ‘jumpology’, although his tongue at this point was firmly in his cheek. “It’s a book where everybody in it is jumping against a pure white background. In a studio and he got everyone to jump – because that way they were less inhibited,” says Fiona. “They were coming to a studio shoot but unexpectedly he was gong to ask them to jump. And the one I always remember was of the Duke and Duchess of Windsor jumping. A fantastic picture!” Interestingly, this is one of Halsman’s non-studio shots, taken in what appears to be the couple’s grand, Parisian villa, but the Duke’s leaping is prodigious. Fiona had met the Beatles the weekend before the shoot in April 1963 at the ABC Studios in Teddington, where they were miming “From Me to You” for the programme Thank your Lucky Stars. “I just sat down next to them and said I was from Boyfriend magazine and would they mind coming up to the studio for a shoot the following week and they said fine. It was as casual as that in those days. You didn’t have to go through a manager or any other official channel. 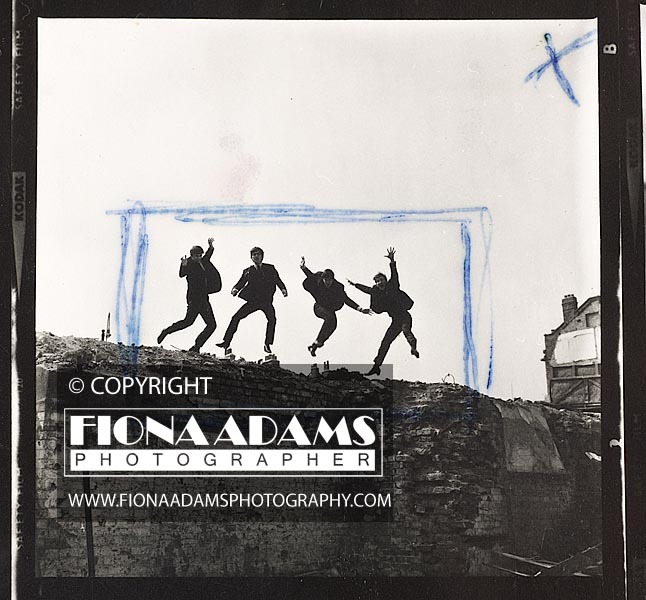 Fiona was not the first photographer to use derelict buildings – witness Don McCullin’s shot ‘The Guvnors’ of 1958 showing a north London gang standing in a decrepit house - and Dezo Hoffman also shot the Beatles jumping in Liverpool that same month, but she was the first to combine the two. Her inspiration produced one of the most famous shots of the ‘60s. Et puis le fameux magazine d'avril 63, Boyfriend, où sont sortis les clichés. Marrant cette histoire de JUMP-STORY, hein ? ...qui sautait sur tout ce qui bouge !!! Tiens, en voila une de Dezo. Avouez qu'il y a comme un air de ressemblance, non ? Donc, ça, c'était du Dezo Hoffmann. Et qui dit Paris dit Sylvie et Trini. le groupe ne semble pas trop trop happy. Et puis un petit doc sur l'homme. Sur ce photographe qui était là où il fallait, au moment où il fallait. photo avec Dezo Hoffmann. Ca date de 1967. On voit aussi que le métier de photographe lui-même est très sommaire, voir amateur. Pas besoin de tonnes de matos. Un petit Nikon, et hop ! Un second film un peu meilleur. Déjà c'est en couleur. Et puis on y voit des images des Beatles avec Dezo. C'est déjà pas mal. Et, de toute évidence, ils ont l'air de bien s'amuser !!! Avec, à la fin, une idée de ce que devait donner leur session JUMP ! Le numéro de BIG NEW BEAT en mode dédicacé. Une interview très intéressante de la fameuse Fiona Adams à propos de cette photo. Et pour cause, puisque les photos de Dezo n'avaient pas encore été publiées. On peut imaginer aisément la confusion dans l'esprit de tout le monde avant que l'affaire ne soit sortie en 2004, puis révélée dans le supplément du Times Saturday en 2006. ‘I think I’ve done much better shoots than that, but it worked for that cover and the jumping image worked very well with the record’s title,’ she said. On her return from Australia in April 1963, she went to an employment exchange in Soho in search of work. She was directed to Picture Story Publications in Regent Street on a week’s contract, but she ended up staying, doing studio and location shoots. "I would ride around on the top deck of a London bus looking for shooting locations." In the same month, The Beatles arrived at the studio and Ms Adams took them in a taxi to a former bomb site at the rear of Euston Station. "This emerged from one of my first assignments for Boyfriend Magazine. I had met the Beatles (then little-known) the previous week (Sunday April 14th 1963) when they were appearing on the popular 'Thank Your Lucky Stars' Show, hosted that day by Jimmy Saville, at the TV Studios in Teddington. 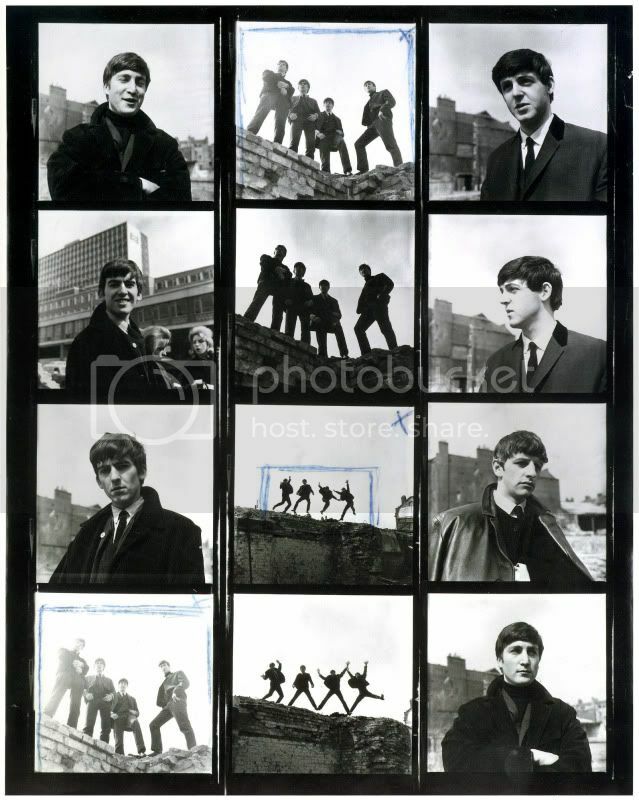 These were very early days and the Beatles readily agreed when I asked them to come in for a shoot." "Come in they did to our cramped little studio at No.21, Kingly Street, W.1. The day was April 18th., 1963. I had been keen at that time to break away from the conventional Hollywood-style of stage and studio shot. To this end, I would ride around on the top deck of London buses to search out possible locations. An abandoned area had caught my eye at the crossroads of Euston and Gower Street. This was still a London blitzed in parts and awaiting rebuilding." "As far as I remember, we all managed to pile into one taxi; the four Beatles, myself and Maureen O'Grady of Boyfriend, - plus the camera gear! I climbed down the rubble into a bombed-out cellar, open to the sky, and had a wonderful session with the Beatles lined up on the wall above who couldn't have been more co-operative. Taken on this single roll of film was the Jumping Shot, the shot which John Lennon and Tony Barrow chose for the cover of the Beatles EP album 'Twist and Shout'." "I shot three rolls of film in total, the contact sheets are shown here with a blow up of the jumping shot with my original cropping marks for printing.Their career hadn’t completely taken off yet, but it did after that," she said. "I remember someone coming out of the building while we were doing it and asking who they were." She did not know that Dezo Hoffman had photographed the band jumping in Manchester a week before, though his images were not published until later. In 2004, Ms Adams took the images and contact strips from that shoot to Christie’s auctioneers for valuation. They put her in contact with Beatles biographer Mark Lewisohn, who did a day-by- day account of the band over a three-year period, including April 1963. He said her story helped to confirm what happened on that day. 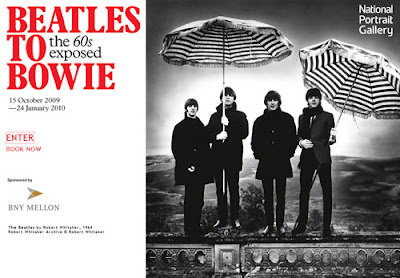 In April 2006, the Times Saturday supplement revealed the photographer of the "Twist and Shout" photo had been found. Meanwhile, Ms Adams had done a deal with Redferns Music Picture Library to market her pictures. 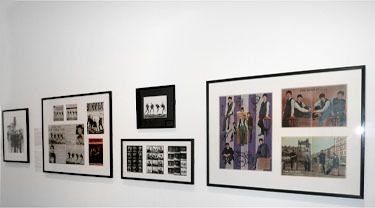 Through Redferns, Ms Adams’ images were displayed in the 2006 "The Beatles on the Balcony" exhibition at the National Portrait Gallery, ironically next to Dezo Hoffman’s. "It’s lovely and I’m very happy about it," she said. "When Redferns contacted me I thought, Wow! 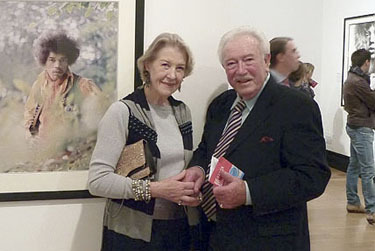 It is a proud moment for me to have my photographs in the National Portrait Gallery." Ms Adams photographed many of the pop elite of the 1960s, including Dusty Springfield, Adam Faith, Billy J. Kramer and Jimi Hendrix. 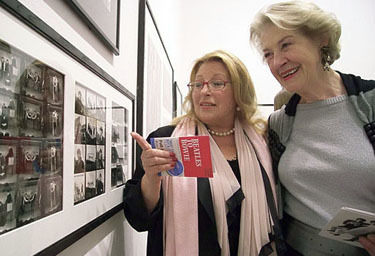 She worked with The Beatles on numerous occasions. "They were great fun and we always had a laugh," she said.